The Dettifoss Trail Run in northeast Iceland is probably the most beautiful and scenic trail race in Iceland. An absolute must do once in your life. The race is held in Jökulsárglúfur in Vatnajökull National Park. The race takes you along the magnificent Jökulsá (Glacier River) canyon and ends in Ásbyrgi canyon. It is said that the Ásbyrgi canyon was formed when Odin’s eight-legged horse, Sleipnir, touched one of its feet to the ground here. The race is held on the second Saturday in August and there are three distances, 32.7 km, 21.2 km and 13 km, which all end in Ásbyrgi canyon. All participants are transported from Gljúfrastofa Visitor Center in Ásbyrgi to their starting point in a bus. Ásbyrgi has a camping site, which is very popular both with Icelanders and tourists. Staying there before and after the race is definitely recommended if the weather is favourable (which it often has been !). The race is well organised with a very lively atmosphere. The scenery is stunningly beautiful but keep your eyes on the trail to avoid mishaps. The longest race starts from Dettifoss and the route is quite varied. The roughest part of the run is between Dettifoss waterfall and tHólmatungur where the surface is sand, rock and rough gravel. Close to Hólmatungur the surface switches to a soil path. The last leg of the route is on narrow sheep paths through birch forest. You need to cross one spring river along the way, which is very refreshing. Dettifoss is at 350 metres above sea level and Ásbyrgi is at 40 metres above sea level but the race is tougher than the elevation change might suggest. Starts at Hólmatungur where the surface is soil path but the vegetation turns more to shrubbery. As with the longest distance you need to cross one spring river along the way. The shortest distance starts at Hljóðaklettar. The race takes you over some rocky surfaces along the old riverbed of Jökulsá river from the time Ásbyrgi canyon was formed. 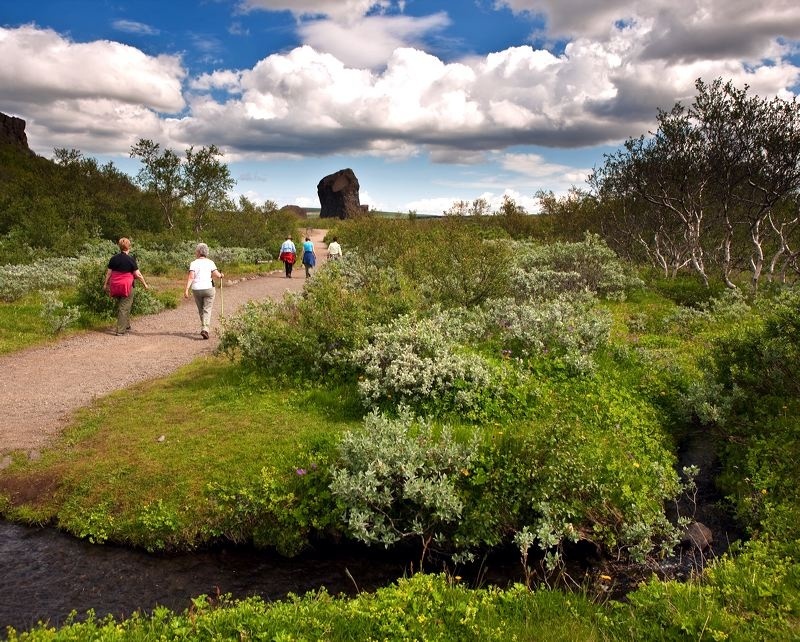 The last leg of the route takes you north alongside Ásbyrgi on narrow paths through a birch forest. We recommend that you take the option to include a meal when you register, as we think it is the perfect opportunity to fill your empty stomach after the race with Icelandic lamb while chatting to your fellow runners. There is a limited number of participants in this race so we recommend to sign up early! Registration closes on the 1st of August. Hi! My family and I would love to do this race but can’t find a current registration. Can you please email me one? Thanks so much!